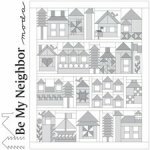 Each Monday, from September 5th through December 19th, Moda will be releasing to shops a new block for their quilt "Be My Neighbor". We will post it here for you to download FREE. We will also have Bella Solid kits available for pre-purchase. There will be 3 purchase options. 1. Prepay each Monday = $9.00 + tax weekly. Available each Friday for pick up or mailed for $6.50 per week. Click here to purchase option 1. 2. Prepay Monday of each month Sept.5, Oct. 3, Nov. 7 and Dec. 5 = $36.00 + tax ( 4 kits per month). Available last Friday Sept. 30, Oct. 28, Nov. 25 and Dec 23rd for pick up or mailed for 1/2 price at $3.25 each month. Click here to purchase option2. 3. Prepay first Week starting September 5th for entire 16 weeks = $144.00+ tax. Kits available 4 weeks at a time last Friday of Sept. 30, Oct. 28, Nov. 25 and Dec 23rd - Free shipping with this option or available for pick up. Click here to purchase option 3. Free printed Black and White patterns available with any of the pre-paid options. 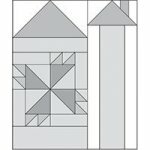 Free printed black and white Coloring sheet and Setting Instructions included with first purchase. Background fabric, backing and binding NOT INCLUDED in kits. 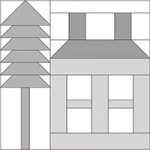 Templates and rulers for easier cutting will be available for purchase. Credit Card must be on file for option 1 and 2. Credit Card will be charged each Monday for Option 1. Credit Card will be charged at the first of each month Sept. - Dec. for Option 2.